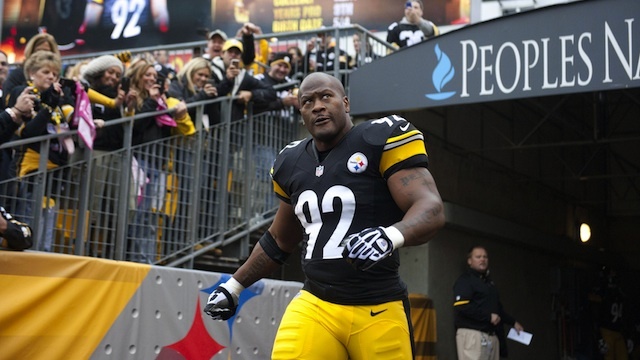 In the wake of Tom Brady having his suspension overturned, James Harrison wants all his fine money back. The Pittsburgh Steelers linebacker on Monday told reporters he’s checking with the NFLPA to explore whether a statute of limitations exists for recouping money lost by fine, per ESPN. Harrison’s agent, William Parise, says he’s indeed discussed this matter with his client. They’ve explored how this might work through the NFLPA. The situation hasn’t gone much farther than that, but Parise is intrigued, largely because of Tom Brady. “Certainly there’s an open door because of the courts overturning the commissioner’s ability to hear his own appeals,” Parise said. In this case, a player sees Goodell striped of power and wants to act. The NFL fined Harrison $125,000 in 2010 and suspended him one game in 2011 for a hit on then-Browns quarterback Colt McCoy.